Daal puri, king prawn rougaille, spiced tea rum baba… The mouth-watering diversity of Mauritian cuisine is testament to the island’s rich cultural history, with influences encompassing French, Creole, Indian, African, Chinese and even British cooking. 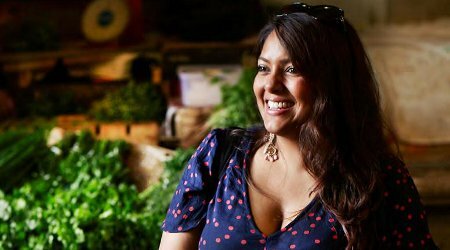 Shelina Permalloo is passionate about sharing the recipes passed down to her by her Mauritian family, and we aren’t complaining! Sunshine on a Plate is the perfect title for her new book: her creations radiate with herbs, sauces and subtle spicing, with an emphasis on fresh ingredients. She caters for a variety of tastes, lifestyles and diets, proposing gajaks (the equivalent of tapas) and quick family suppers, as well as options for vegetarian and gluten-free chefs. Shelina cooked her way to victory in 2012’s Masterchef competition, wowing the judges and inspiring legions of followers. After a successful career in the charities sector, she has chosen to focus on her culinary projects, and there’s a real buzz surrounding her at the moment. We’re eager to meet her, learn the secrets of her exotic, home-spun cooking, and taste the results!